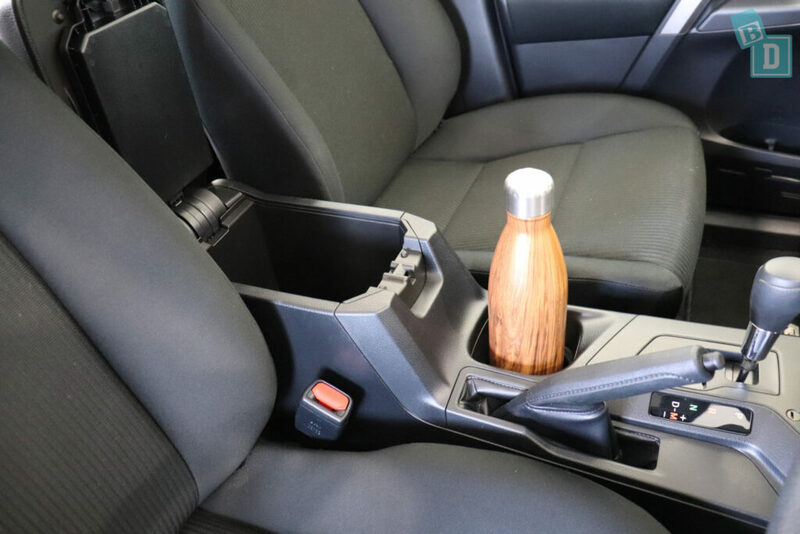 A functional SUV with a fantastic cup holder!! 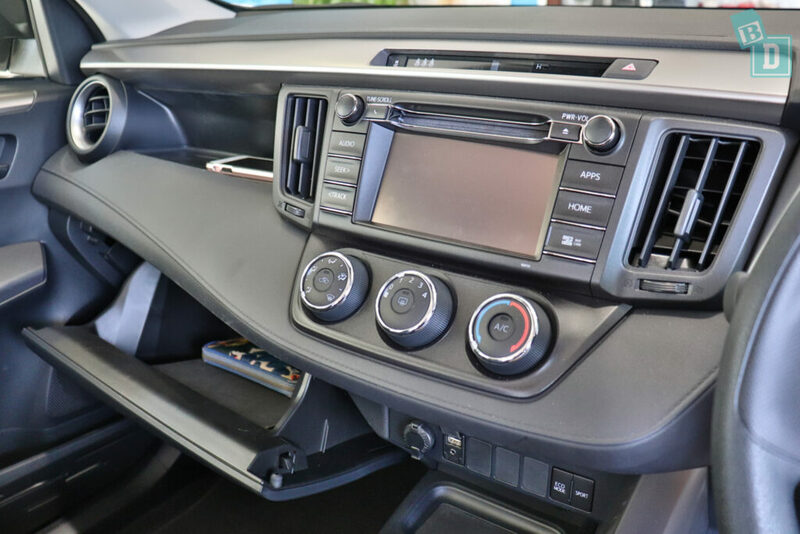 I have been intrigued by the Toyota Rav4 for a while, so many people ask me to review it and I had never driven one so I was eager to see how it is as a BabyDrive. The Rav4s I remember were sporty little fun, jeep-like looking things but they have changed considerably and the practical SUV I tested was far from the character-filled buggy I remembered! 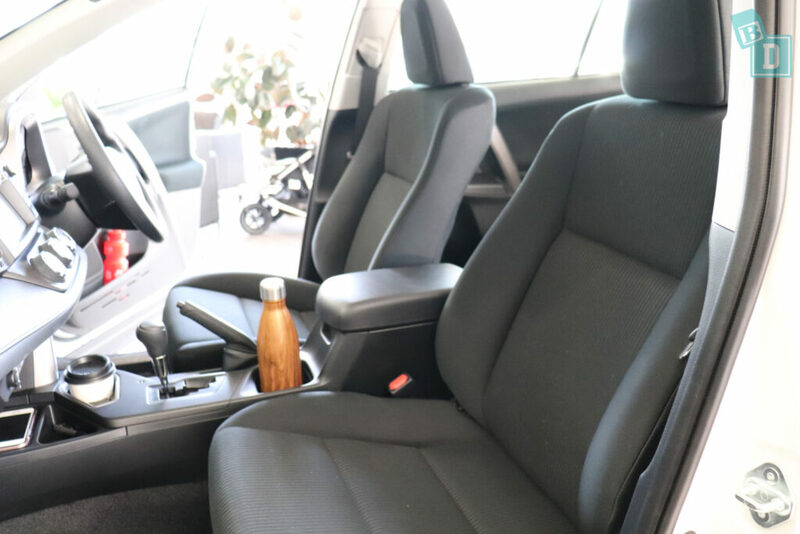 I tested the GX and GXL models, both of which felt very ‘practical' and the GXL had leather seats which is a great feature as they wipe clean, whereas the GX had woven upholstery seats and door panels which are harder to clean. Originally being a Pom, I LOVE my cup of tea, so I was impressed by the cup holder in the front which would be the right shape for an actual china mug, with handle! I'd find this useful for mornings when you rush out the door and haven't had a second to drink your tea or coffee!! 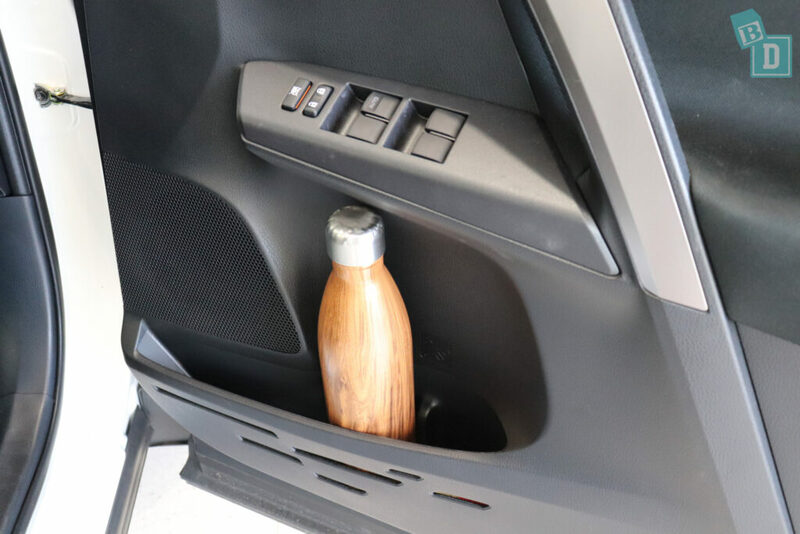 There is also a shelf in the dashboard which would also be useful for all the random stuff kids pass you while you're driving along, like empty sultana boxes etc!! There's always the worry it would become a collection point for kids' junk!! 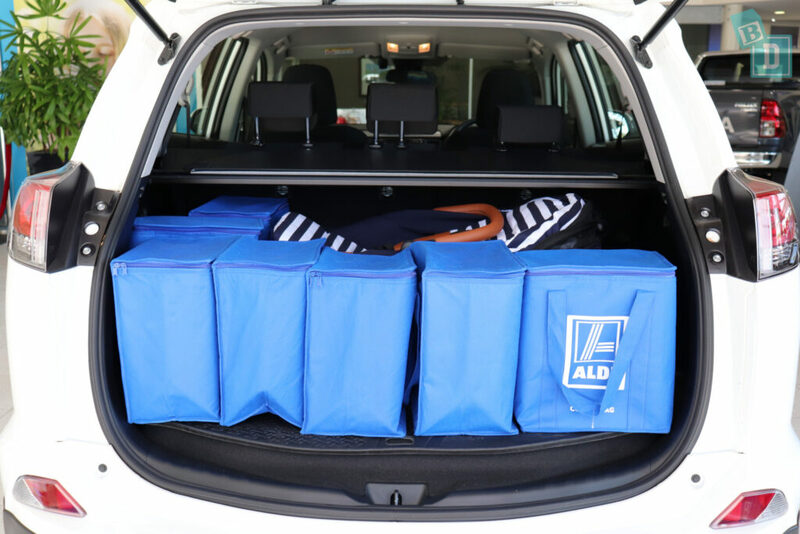 Storage throughout the Rav4 was functional, with small door bins in the front and back that hold large refillable water bottles and both the glove box and central console box are also good sizes. 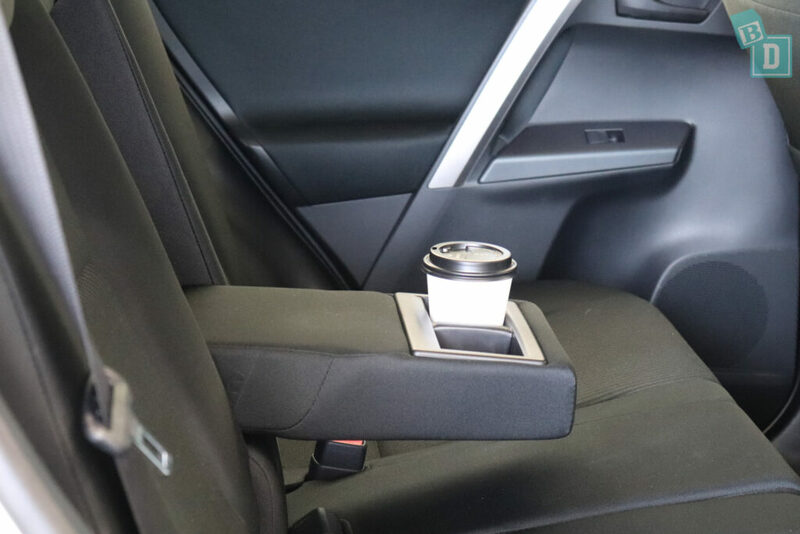 But the cup holders in the armrest that folds down from the central seat back are square-shaped, which isn't very practical as cups rattle around in them. In the boot, there is a storage net which is a great feature for holding balls and lunchboxes etc separately from what's in the rest of the boot but there isn't enough depth in the boot for that above a folded up stroller. 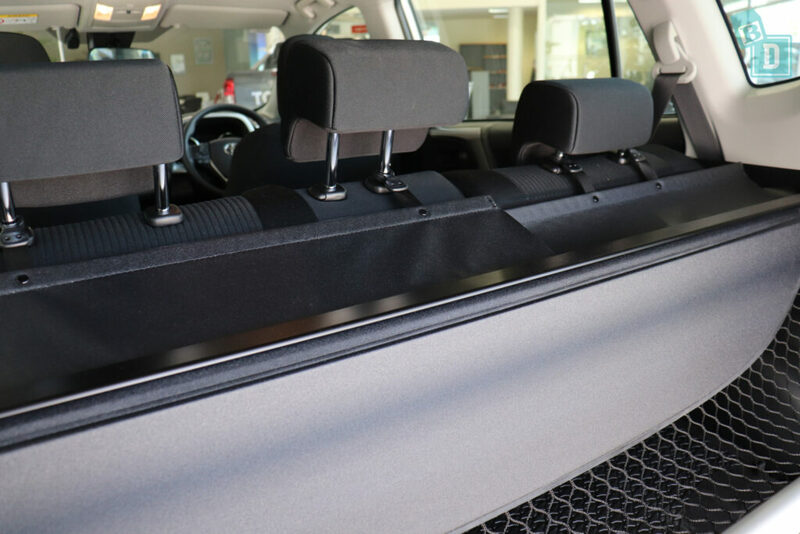 The retractable roller blind does have the clips that connect it to the headrests of the back seat which I am not a fan of and think they'll break easily over time, the rubber floor mat in the boot is a great BabyDrive feature so you can take it out and hose it off! Storage in the boot of the boot of the Rav4 was good, I could get fifteen shopping bags in the boot when it is empty, which is the same as the Subaru Forester and three more than the Kia Sportage. All sizes of strollers fitted in the boot with good amounts of shopping bags around them and I found it a good useable space. There are three top tethers in the seat backs that are easily accessible through the boot, and though they are not within plastic guides they are clearly labelled. 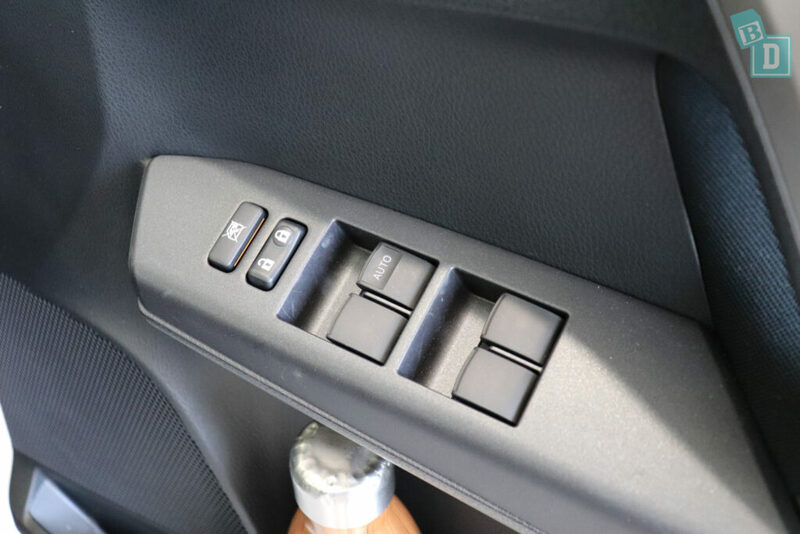 There are two sets of ISOFix points, in the two outer rear seats, which are within plastic guides and I found them easy to connect to. I was able to instal two child seats in the back of the Rav4 and found there simply wasn't room for a third child seat in the middle. With rear-facing child seats installed, the legroom was tight for a 180cm passenger in the front and they only have 22cm of knee room. 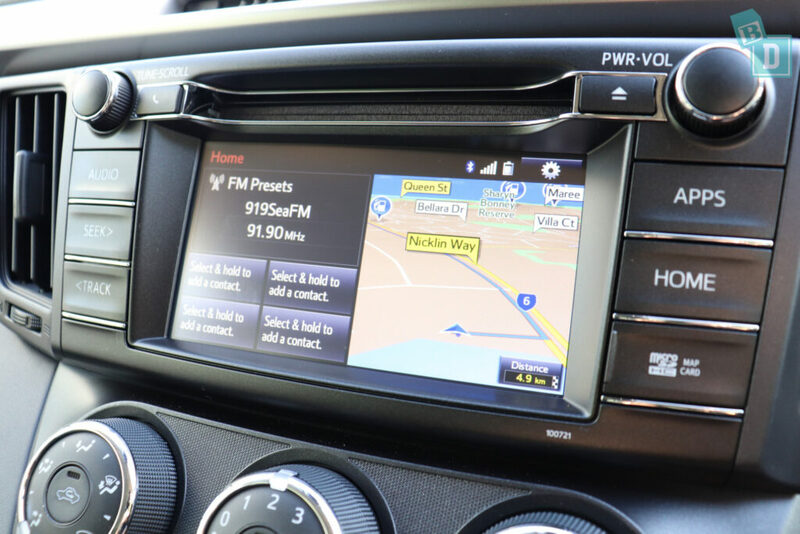 The media system in the Rav4 does not have Apple CarPlay and Android Auto and the media screen is quite small. The system is quite old fashioned but easy to navigate. The Sat-Nav is quite easy to use although I couldn't find a way to mute the voice guidance. 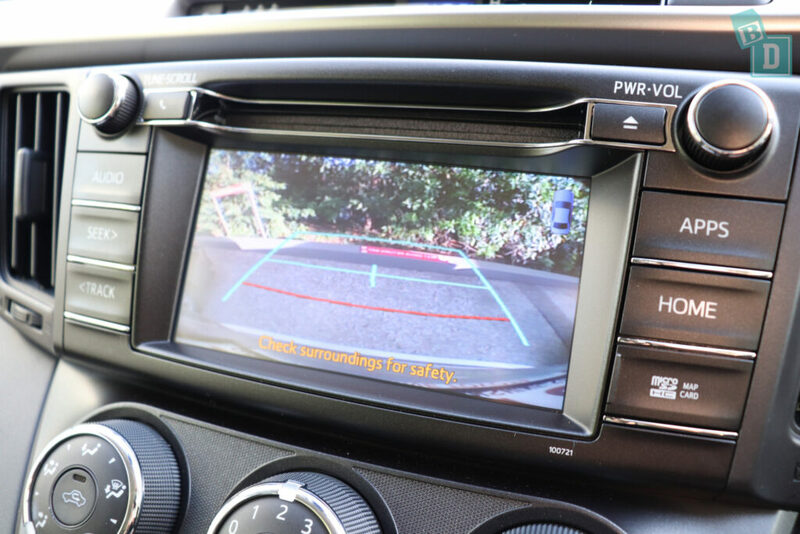 The reversing camera screen image is small and not very crisp. 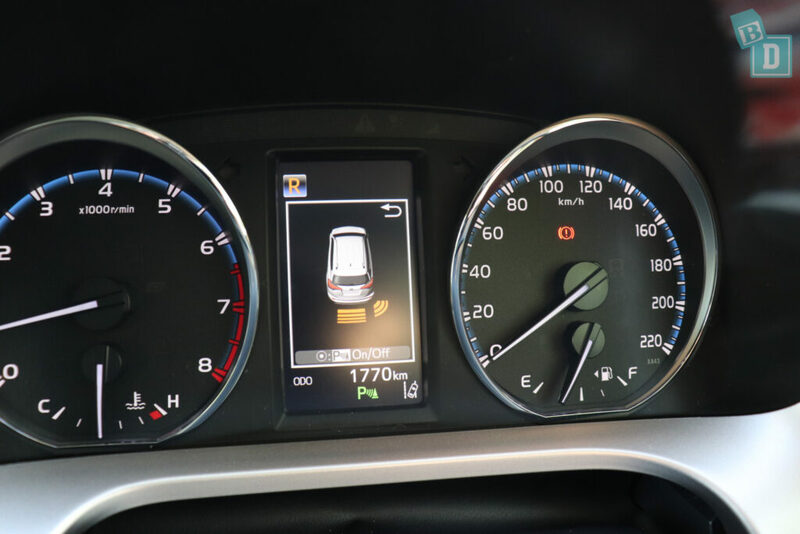 The parking sensors sound could be turned on and off easily by pressing a round button on the steering wheel and this shows up in the display in front of the steering wheel. 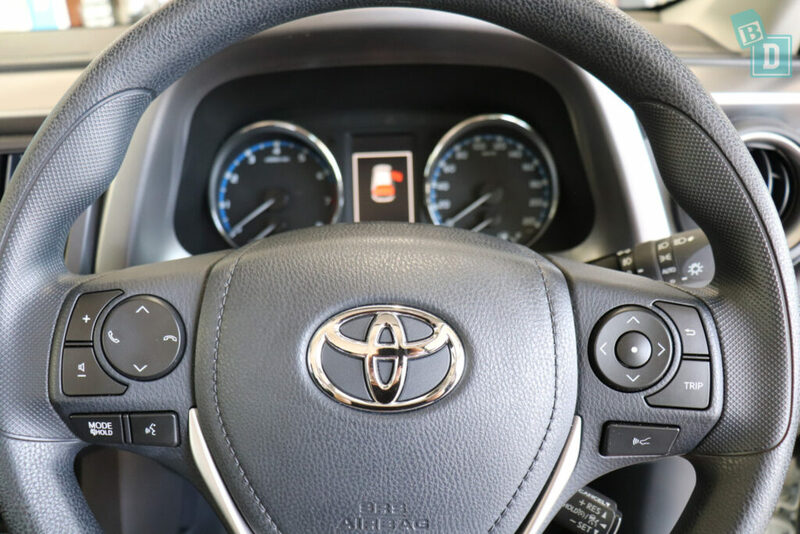 I found when I drove the Toyota Rav4 GX lower spec model it had a thin and cheap feeling steering wheel and the drive felt ‘revvy' especially when accelerating. However, the higher spec model the GXL had a thicker steering wheel and a hard but more confident and a lot less ‘revvy' ride. Overall the Toyota Rav4 was a great BabyDrive, it is functional and has some nice storage features. The Toyota Rav4 scored a five-star ANCAP safety rating in 2016 and has seven airbags as standard. 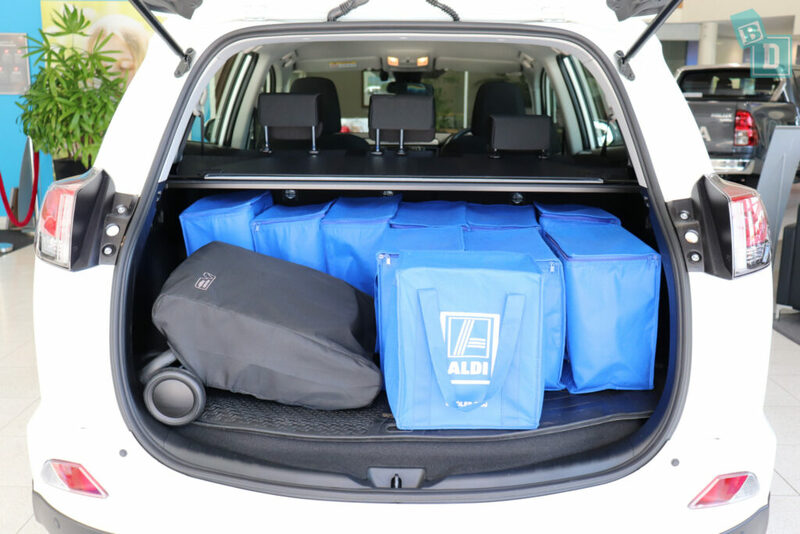 So… How big is the boot of the Toyota Rav4? 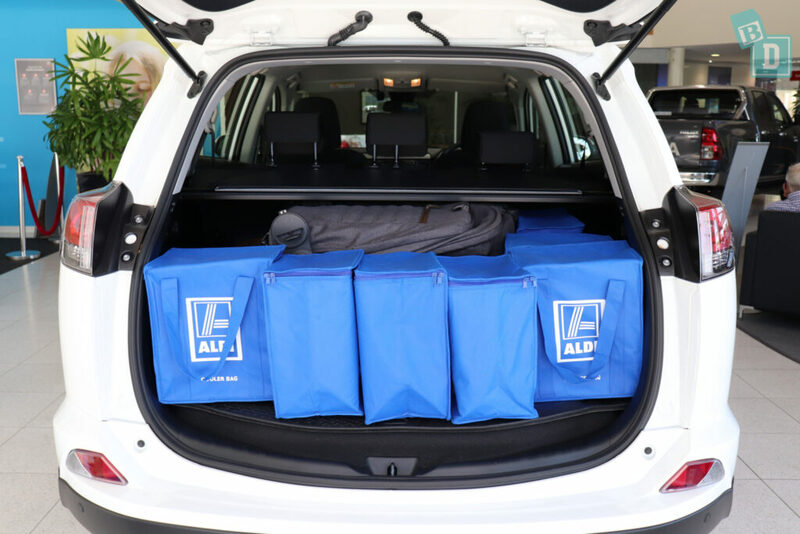 From empty I could fit 15 shopping bags in the boot, which is the same as the new Subaru Forester and three more than the Kia Sportage which held twelve. 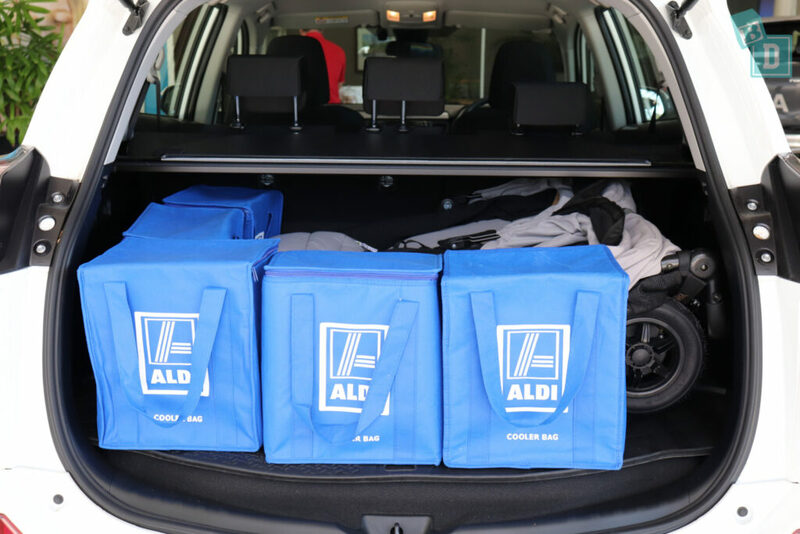 The depth of the boot with the retractable roller blind across is just enough for reusable shopping bags. 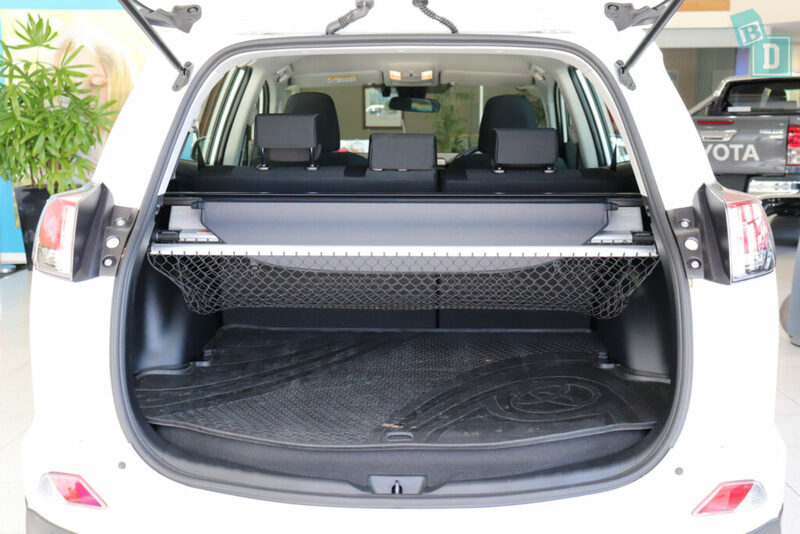 The boot of the Rav4 does have handy net storage which would be great for balls, lunch boxes etc to stop them moving around the boot, but there isn't room for this when you have a collapsed stroller in the boot. The Mountain Buggy Duet twin stroller fitted with five shopping bags beside it. The Britax Flexx tandem stroller fitted with seven shopping bags beside it. The Mountain Buggy Urban Jungle single stroller fitted with seven shopping bags beside it. The Mountain Buggy Nano compact stroller fitted with 10 shopping bags beside it. The boot floor is flat so it's good for an emergency nappy change and in the GX model, there was a rubber floor mat which would be great for taking out and hosing down when it gets dirty. The retractable roller blind has two flaps of fabric covering the gap between the seats and the bar which I am not a fan of because I think the plastic clips that hold it on will break easily over time and keep falling down into the boot. Storage in the cabin was functional. The front door bins will hold a large refillable water bottle. 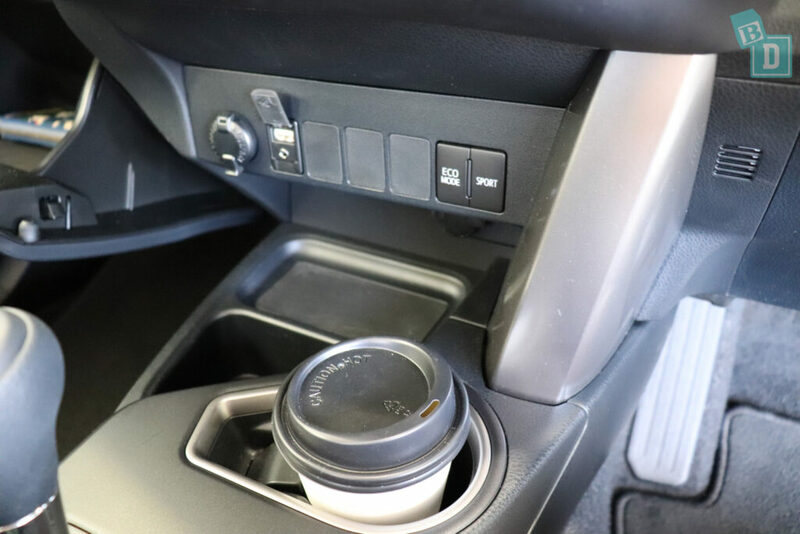 There are two cup holders in the central console, one was shaped so a china mug would fit which I think is brilliant if you haven't had a chance to even start your cuppa before you leave in the morning you can take it with you. It held a reusable and disposable coffee cup too. Behind it was another holder that I found best for my large refillable water bottle. The central console storage box was simple and a usable little size too and the lid doubles as your armrest. 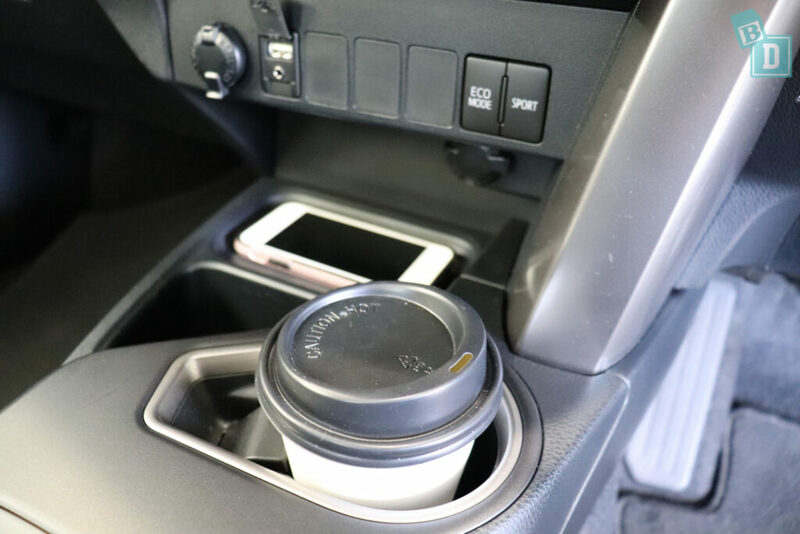 In front of the cup holder is a rubber-lined well that would hold my phone and the 12V, AUX and USB sockets are here too. There is also a deep, triangular shaped storage well next to it I found useful. 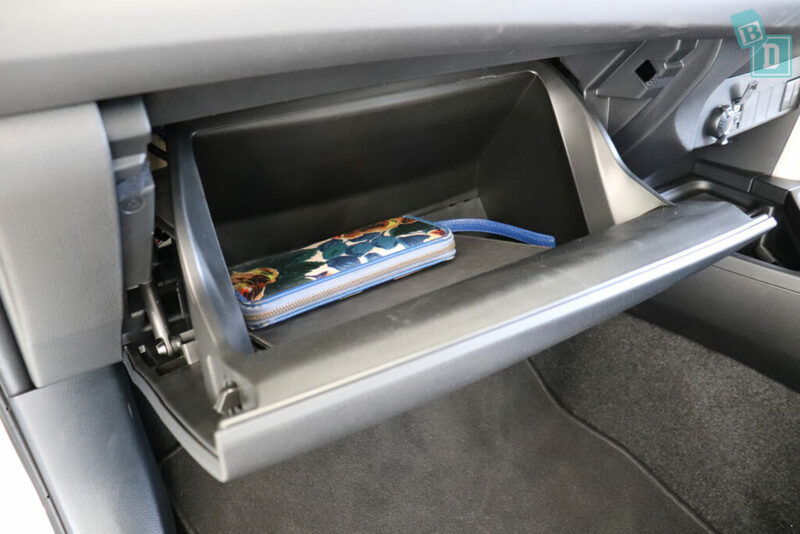 The glove box is a practical size and shape; without the manual in it would hold my wallet and iPad easily. The Rav4 has this great shelf in the dashboard which I know my family would quickly fill this up with sultana boxes, banana skins and all the other stuff my daughter passes me while we're driving along!! 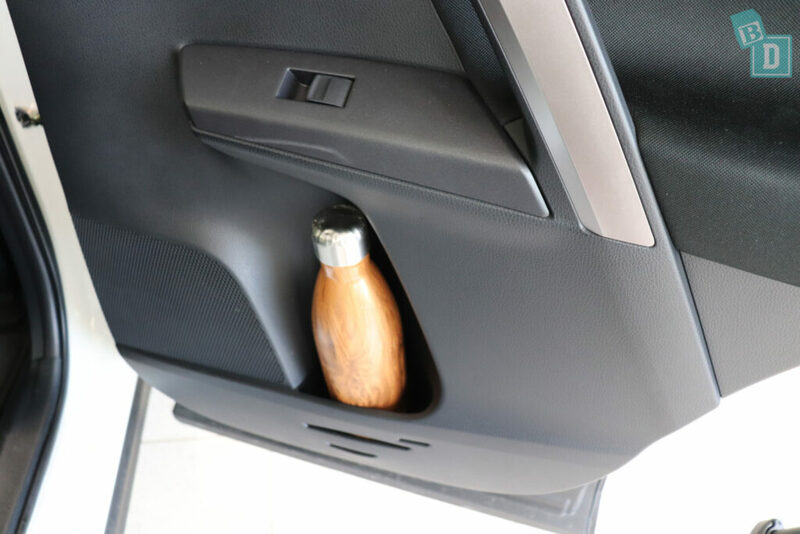 In the back, the doors have small door bins but they will hold a large refillable water bottle which is great. 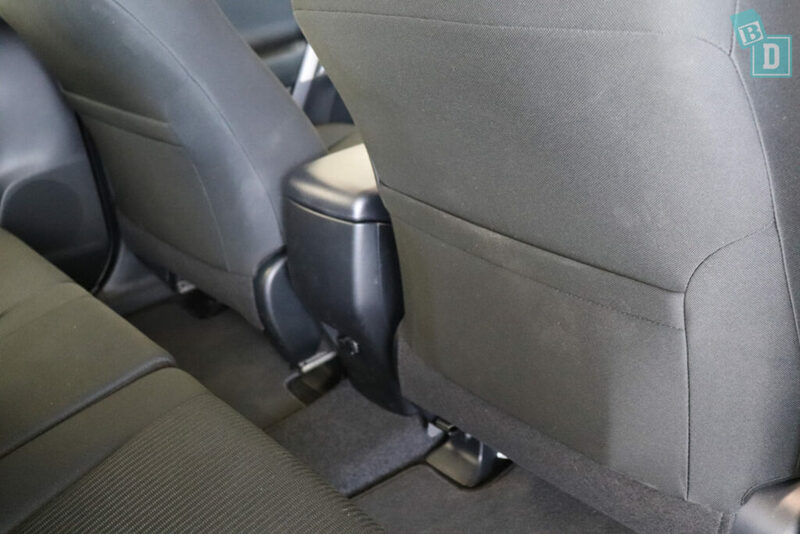 There are map pockets in the back of both front seats that will hold and conceal an iPad. In a fold-down armrest in the central seatback are two funny shaped, square cup holders. They would hold a disposable coffee cup but their shape meant nothing else fitted well. 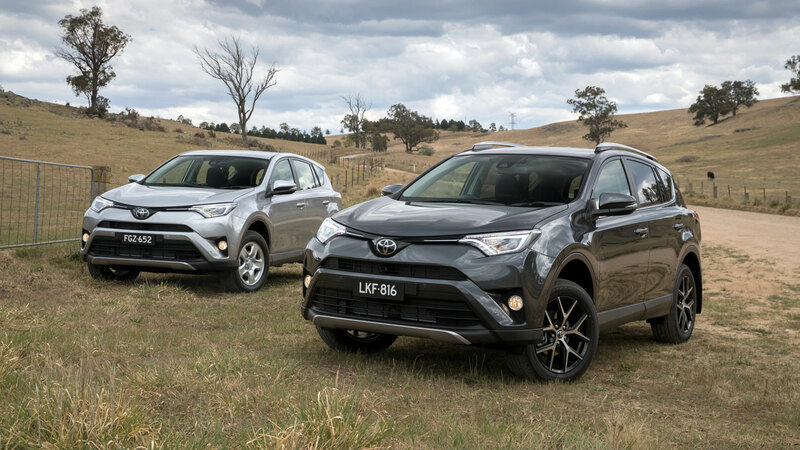 So… How noisy is the Rav4? 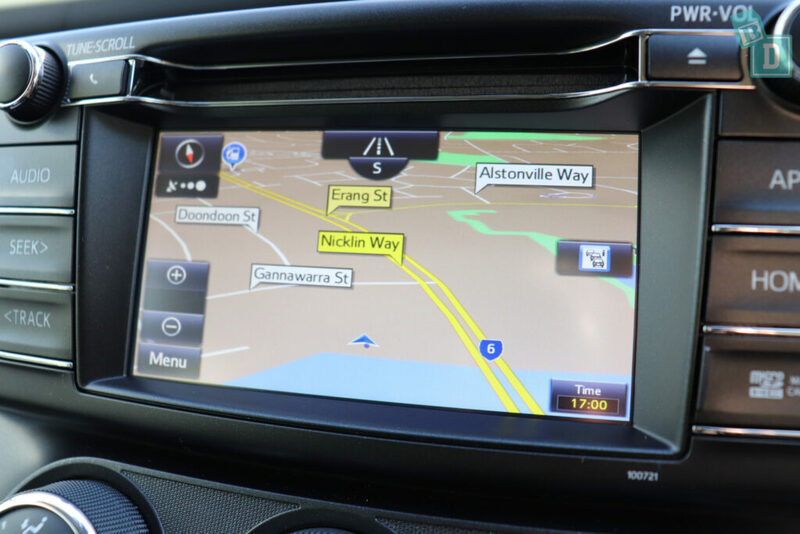 The media system in the Rav4 has a small screen, it is quite basic but that does make it easy to navigate. It doesn't have Apple CarPlay or Android Auto. 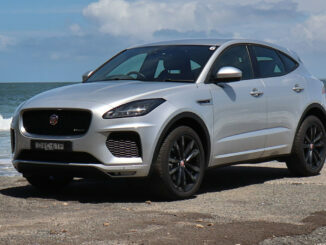 When reversing, the camera image quality isn't too bad but the screen is small which makes it difficult to use. I found I could turn the parking sensors off relatively easily by pressing the circular button on the steering wheel. There was a visual in the head-up display in front of the driver as well. The indicators are nice and quiet in the Rav4 and wouldn’t disturb my sleeping baby. 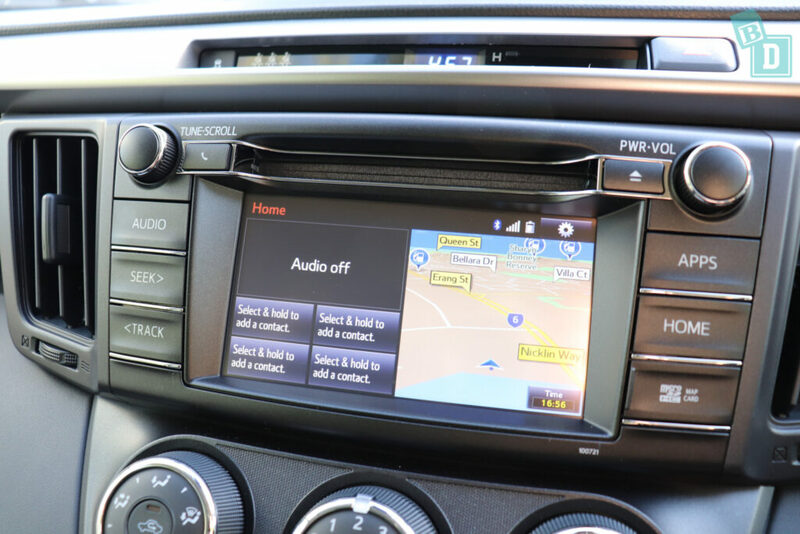 The Sat-Nav was nice and easy to use, which I find with most Toyotas, however, I could not find a way to easily mute the sat-nav voice guidance. The Rav4 does have lane departure and the button to turn that on and off is down by the driver's right knee. The windows of the Rav4 are a little clunky to open and close. The doors are nice and quiet to open and close so wouldn’t disturb a sleeping bub. 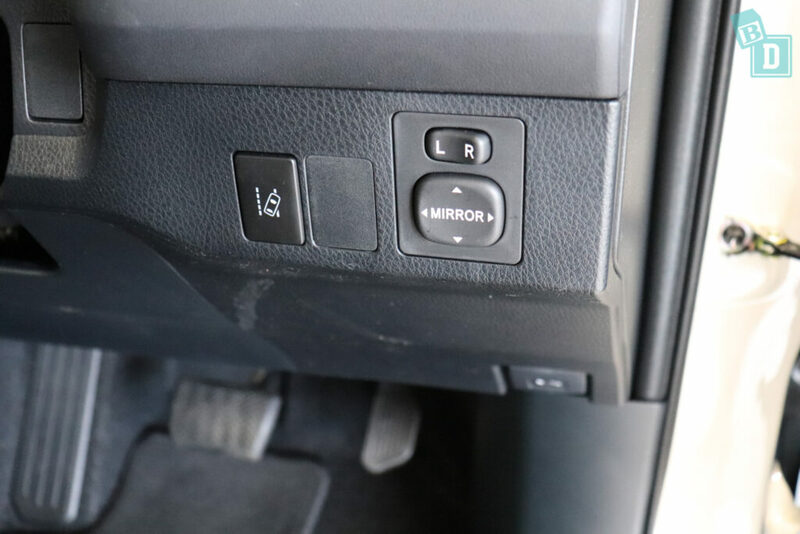 The doors and windows can both be locked from the driver's door control panel. I found you can come to a stop with the engine still running and get out of the car without sounding any alarms. The Rav4 GX cheaper model feels quite ‘revvy’ and loud when accelerating even at low speeds around town. The GXL higher spec model didn’t have this loud revving when accelerating. 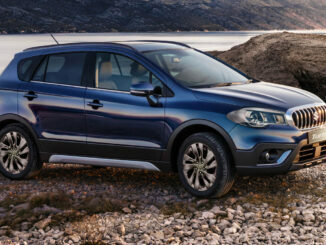 The seatbelt removal alarm for the rear seats beeps and a warning light displays on the dashboard and for the front passengers, the warning light displays in the drivers display infant of the steering wheel. 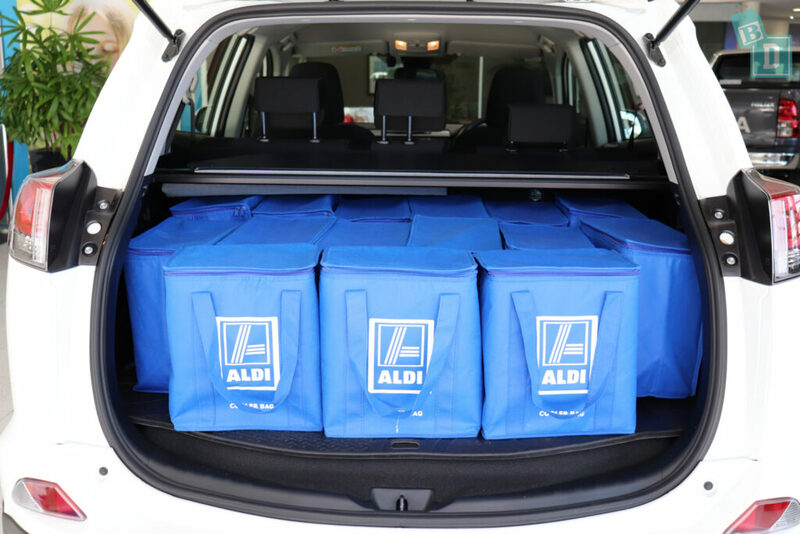 So… How many child seats fit in the Toyota Rav4? 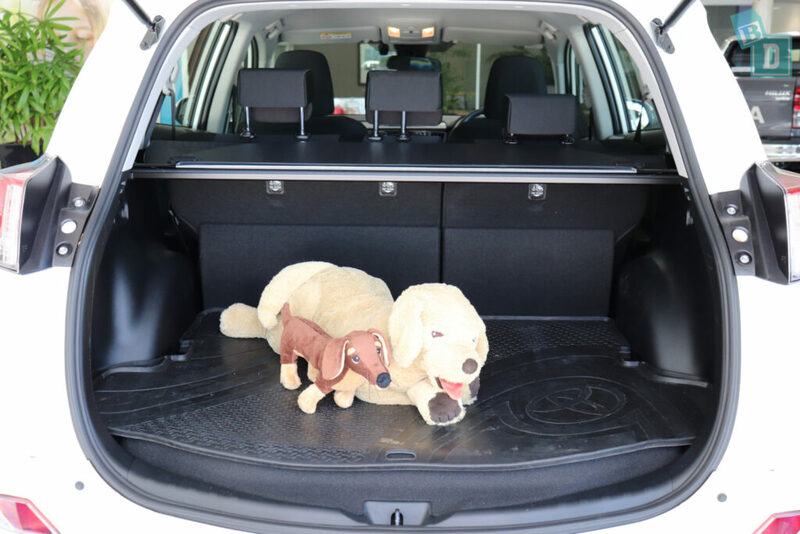 There are three top tether points across the rear seat backrests of the Rav4 and they are easily accessible through the boot. They are not within plastic guides but are clearly marked and I found them easy to connect to. 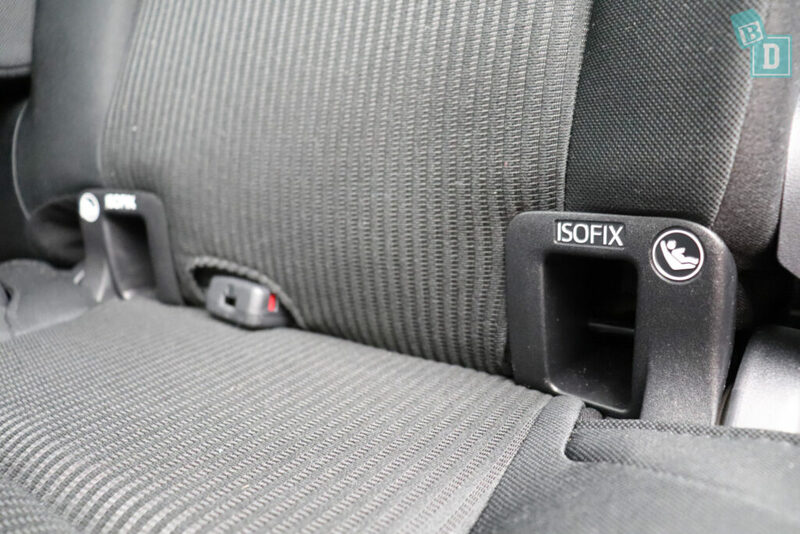 The rear seats have ISOFix points in plastic guides in each of the outer seat bases, which I found were nice and easy to connect to when installing the child seats. 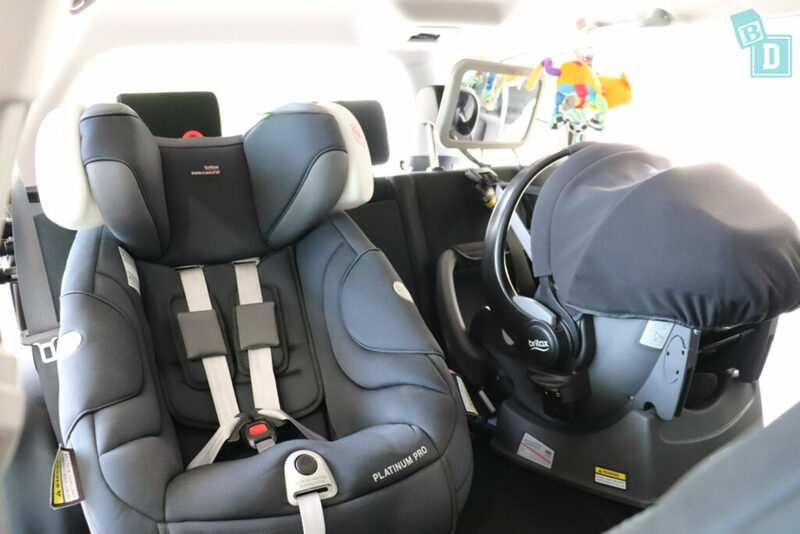 I managed to fit two child seats into the Toyota Rav4 really nicely: The rear-facing Britax Unity infant capsule and forward-facing Britax Platinum Pro. 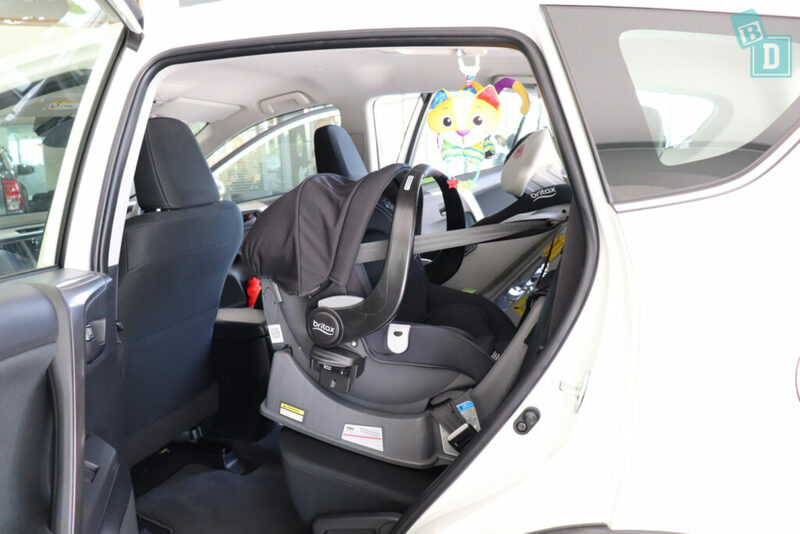 Posting bub into their child seat from inside and outside the car is really easy in the Rav4. The ceiling is high enough, making it easy from inside and there are lovely big open doorways that give you plenty of room for posting bub in from outside too. There is room to feed bub in the back if you only have one child seat installed. The seats are upholstered with woven fabric which would be hard to wipe clean than leather. 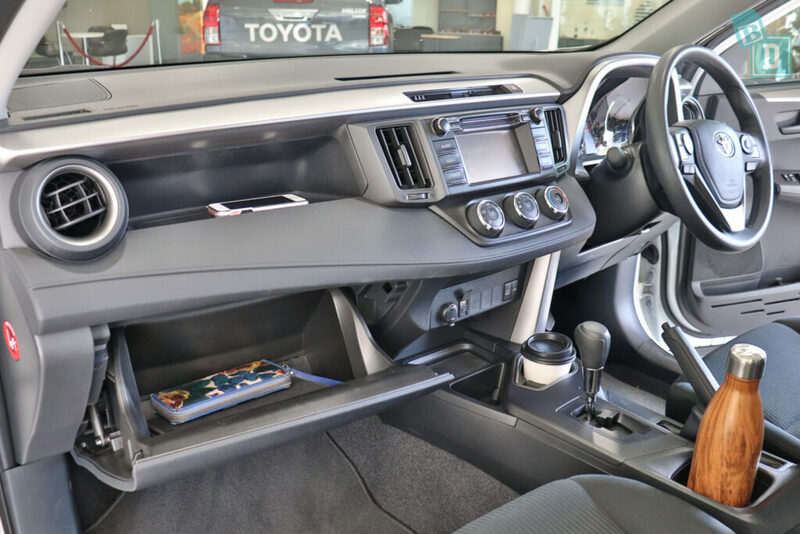 So… How comfortable is the Toyota Rav4? And How good is the Toyota Rav4 to drive? In the front of the Rav4 GX, the seats are comfortable, they have manual adjustment and are upholstered with woven fabric which is also used on the doors too and I find harder to clean. The headrests are not adjustable but I found I can have a ponytail in the front seat. 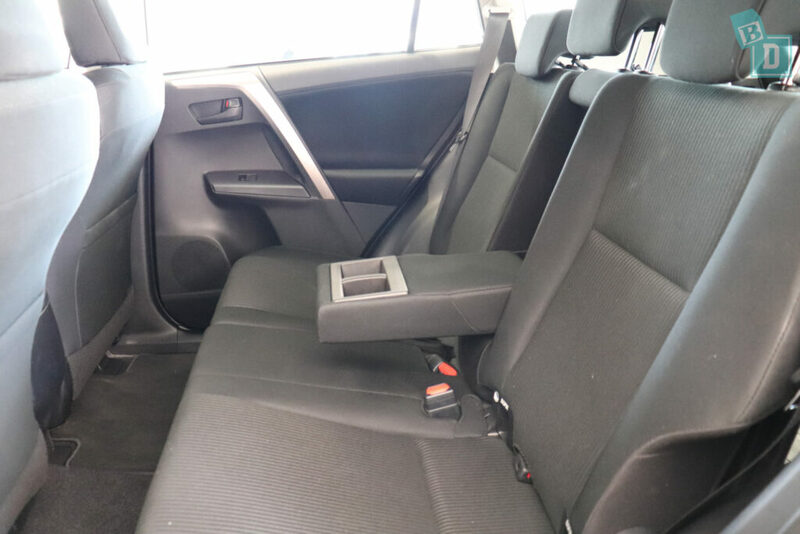 For a mum travelling in the back with bub, the seats are comfortable at the sides, there is a hump in the central seat base and in the footwell, it is not too bad to rest your feet on or to straddle. The seats are comfortable but you can feel the hard central backrest because of the fold-down armrest with cup holders. There are four air-conditioning vents across the front dashboard; two central ones and a round one at either end. The controls for the aircon are three large dials on the central dashboard, which I found nice and easy to locate and use whilst driving. 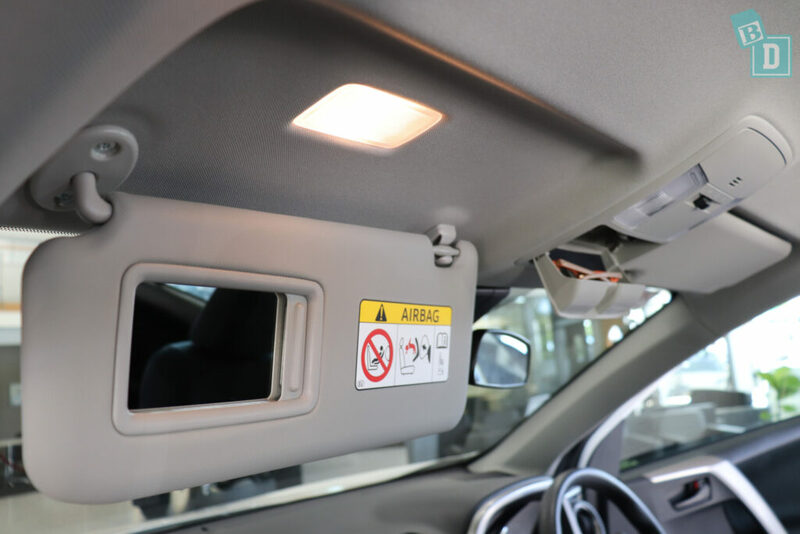 The interior lights in the rear are in the ceiling centrally and too far to reach them from the driver's seat while driving! 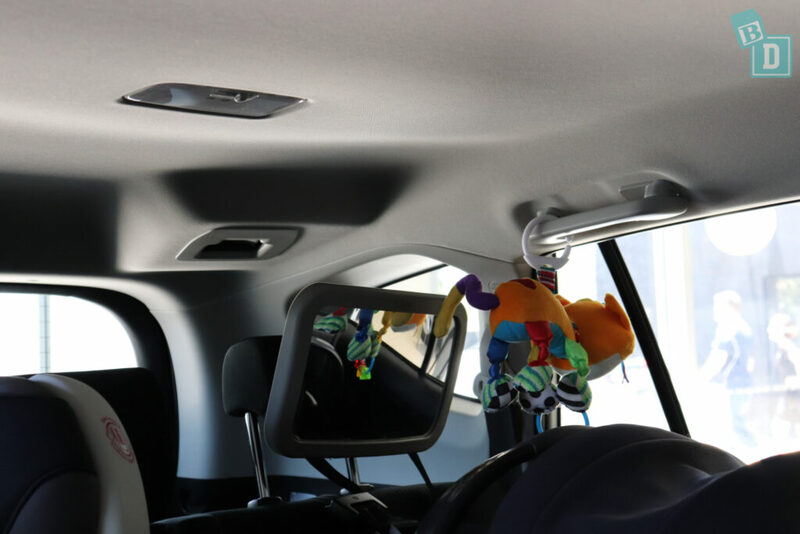 Visibility in the Rav4 is tricky, the rear windows slope up the back making it harder to see out of especially when you have two child seats installed. 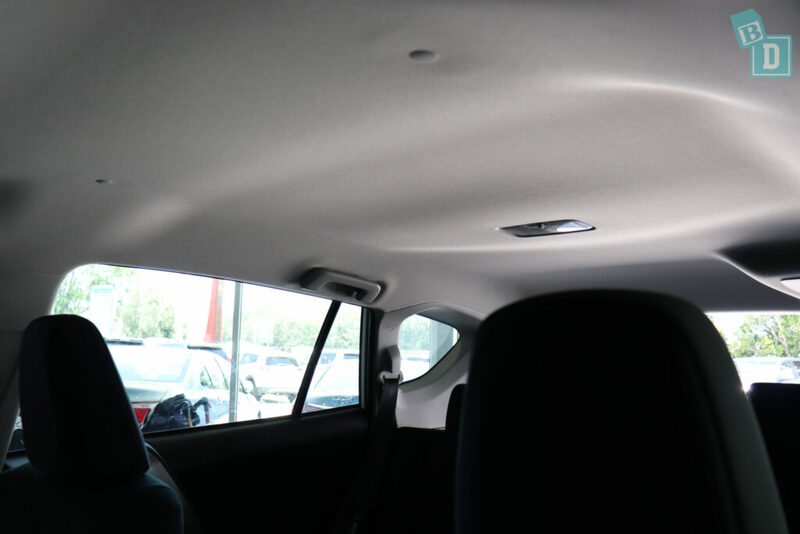 The central seatbelt comes from the ceiling so if you were using the central seat that would affect the driver's visibility too. One thing I have noticed since being a mum is I hate it when I reach a destination or get home from being out and Tulsi has either done really well in the car or she is screaming her head off and I have done really well to keep it together for the entire journey (usually the latter!!) and it takes 10 minutes to park the car! It can be really stressful. Usually I dread parking new cars as they take longer in our tight apartment block carpark, but the Rav4 was relatively easy to park. 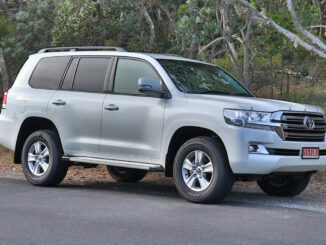 There are vanity mirrors in both front visors but they are not extendable. 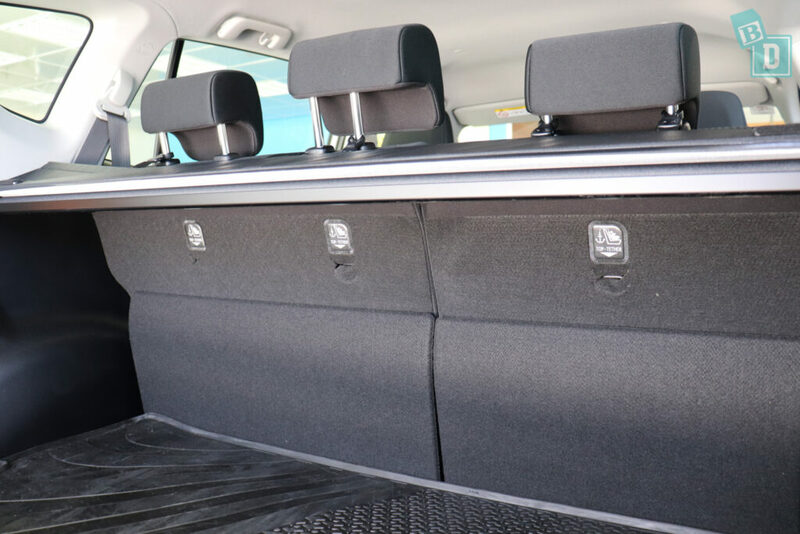 The door panels in the new Rav4 GX are woven fabric as well as the seats so they would not be easily wiped clean and would get child spills and crumbs ingrained quite quickly. 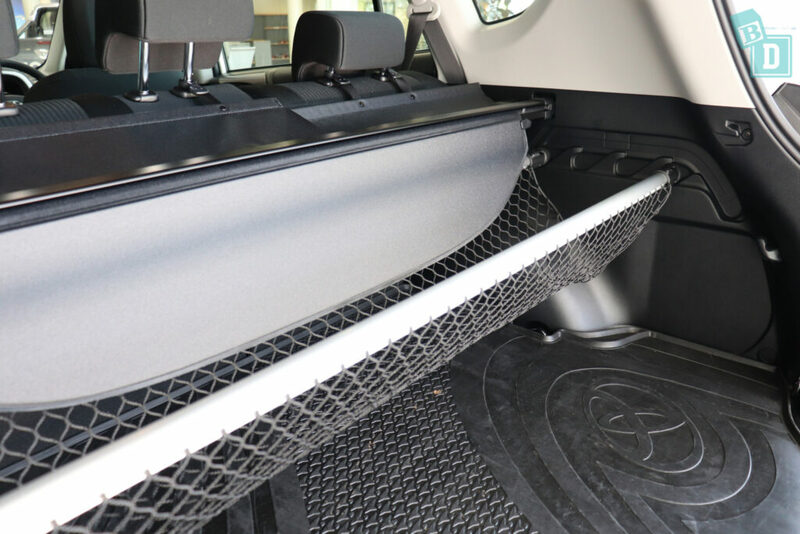 There were carpet floor mats throughout the lower spec GX model I tested and a rubber floor mat in the boot. 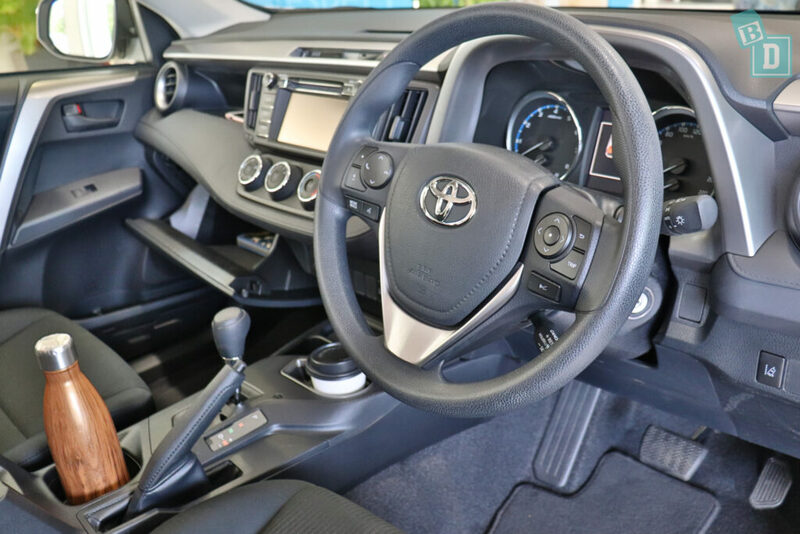 Aesthetically the RAV4 looks and feels very functional and practical in the interior, I found the steering wheel in the lower spec GX model was thin and felt cheap in feel compared to the higher spec GXL model. The Rav4s I tested did not have a powered tailgate. So… How safe is the Toyota Rav4? The new Toyota Rav4 scored a five-star ANCAP safety rating in 2016. Scoring a total of 34.56 out of 37 in testing, 13.56 out of 16 for the frontal offset test, full marks for the side impact test and pole test and pedestrian protection was rated acceptable. Seven airbags come as standard; there is a driver’s knee airbag as well as dual frontal airbags and front side airbags and side curtain airbags for the front and the rear side passengers. As standard all models of the Toyota Rav4 come with anti-lock braking system (ABS), electronic stability control (ESC), electronic brake-force distribution (EBD), emergency brake assist (EBA), daytime running lights (DRL), hill launch assist and reversing collision avoidance. Lane support systems (LSS), automatic headlights, automatic high beam, blind spot monitoring (BSM), autonomous emergency braking (AEB) and adaptive cruise control (ACC) all as optional extras on some variants. What is Blind Spot Monitoring or BSM? What is Electronic Stability Control or ESC?